Acyclovir is an antiviral drug which is effective against herpesviruses. Acyclovir is a nucleoside analogue which is especially directed at herpesviruses. It is used to treat infections with herpes simplex and varicella zoster viruses. The molecular formula or acyclovir reads C8H11N5O3, its molecular mass amounts to 225.21 g/mol. It presents itself as a white powder and is hardly soluble in water, very slightly soluble in 96% ethanol, and effectively insoluble in heptane. The substance is soluble in diluted mineral acids and diluted alkali hydroxide solutions. In order to have an antiviral effect, acyclovir must be transferred to the triphosphate form. The first phosphorylation happens selectively via the virus coded thymidine kinase in cells infected by the virus. The following phosphorylations are conducted by endogenous (human) enzymes. All uninfected cells lack the special thymidine kinase associated with the virus which makes the activation of acyclovir in those cells much less likely. 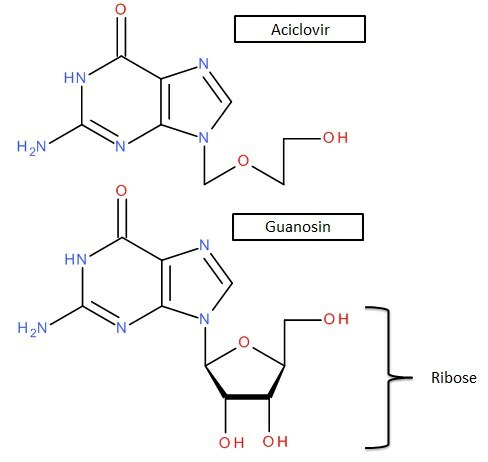 Acyclovir in its active form is built into the viral DNA instead of the natural guanine nucleotide. However, since the ribose part is missing, no further nucleotides can be synthesized onto the strand which results in chain termination. Furthermore, the virus DNA polymerase remains fixated to the acyclovir and is not available anymore for further DNA syntheses during the course of virus replication. Acyclovir can be applied systemically, as well as locally. For the systemic administration, intravenous injection is preferable because bioavailability for peroral application is only about 25 per cent. For the oral administration, Valacyclovir (an ester of acyclovir which has better bioavailability) is preferable. The local administration is mainly conducted in the form of ointments and creams in cases of lip herpes. The elimination half-life of acyclovir on average is about 2.5 hours; the substance is eliminated in unchanged form almost exclusively through the renal pathway. Acyclovir is used in serious cases of infection with the herpes simplex virus (e.g. 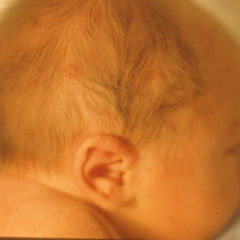 herpesviral encephalitis), especially when serious progressions are to be expected due to immunosuppression. Acyclovir can also reduce the disease duration in reactivating diseases like shingles and reduce the rate of complications. Acyclovir cremes are often used to treat lip herpes. Functional impairment of the kidneys due to crystallization of the substance in the tubule system. Therefore, it is always important to pay attention to sufficient diuresis. Symptoms in the CNS like dysphoria, lethargy, disorientation or confusion. Extravasation should be avoided due to acyclovir having tissue-damaging properties.